The brigantine Black Pearl will be sailing from the village of Lewiston, NY, beginning mid July to approximately the middle of October, depending upon water levels. Advance reservations for all excursions are strongly recommended. Enjoy a one hour interpretive tour of the Lower Niagara River hosted by volunteers from the Historical Association of Lewiston. Hear the history, see the sites and arrive back in time to attend a free concert at Artpark! One hour cruise departing at 6:00 p.m. Begin your weekend aboard Black Pearl, the founding flagship of the American Sail Training Association. Departing from Lewiston, we will cruise the Lower Niagara River into Lake Ontario. Watch and enjoy as sails are hoisted and the wind moves us over the water. So much fun and a sunset too! Three hour sail departing at approximately 6:00 p.m. Departures on Saturday at Noon, 1:30 p.m., 3:00 p.m. Departures on Sunday at Noon, 1:30 p.m. Enjoy old world sailing on the Lower Niagara River and Lake Ontario. 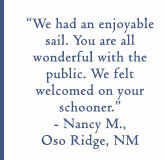 Three hour sail departing at 3:00 p.m.
Planning a special celebration or just looking for something different to do? We can custom design a package for you! An unforgettable voyage with family and friends-- PRICELESS! Gift certificates available. We gladly accept Visa, MC, Discover cards and personal checks* for all advance payments. *$20 fee for non sufficient funds. It is suggested that you book early if you would like to reserve a special date. A full refund will be issued if you must cancel within 30 days of booking and more than 60 days before sail date. If you decide to cancel within 60 days of original sail date, your deposit will be forfeited. You may however, re-schedule your sail (based upon availability) up to one week before sail date with no penalties. Occasionally, cancellations may become necessary due to unsafe weather conditions as determined by the Captain. Rain showers do not necessarily mean the sail will be cancelled as this is all part of the experience. It is up to the discretion of the Captain whether the elements are too harsh for an enjoyable excursion. Please check the weather report the morning of your charter date and dress appropriately! Also, due to the unpredictability of Mother Nature, we cannot guarantee wind. All cancellations made by the Captain will be re-scheduled. If no other date is acceptable, a full refund will be given. Gift certificates are good for two years from date of issue. No refunds on gift certificates.